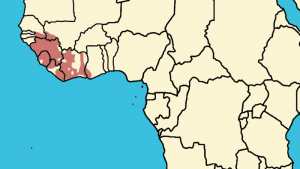 West African chimpanzees (scientific name, Pan troglodytes verus) live in eight West African countries – Senegal, Mali, Guinea Bissau, Guinea, Sierra Leone, Côte d’Ivoire, Ghana and Liberia. Although they are found in eight countries, they population numbers are still small and the species is considered endangered. 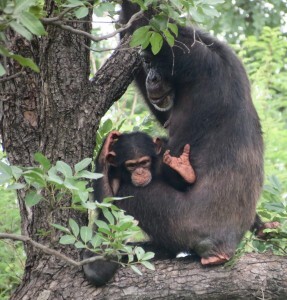 West African chimpanzees live in forests in the southern countries of West Africa, and in wooded savannas farther north. They are known to use tools to hunt small mammals (bushbabies), crack open nuts, and fish for termites.